The average sales price of a home in New York City during the fourth quarter of 2018 was $938,000, a two percent increase from the fourth quarter of 2017, according to the Real Estate Board of New York’s (REBNY) Residential Sales Report. The average sales price of a condominium unit in New York City rose three percent year-over-year to $1,618,000 in the fourth quarter of 2018. The average sales price of a condo increased five percent year-over-year to $2,532,000 in Manhattan and four percent to $1,051,000 in Brooklyn. In Queens, the average sales price of a condo decreased ten percent to $630,000 in the fourth quarter of 2018. The average sales price of a cooperative unit in New York City during the fourth quarter of 2018 was $766,000, up four percent from 2017’s fourth quarter average. Year-over-year, the average sales price of a coop in Manhattan increased by one percent to $1,239,000; in Brooklyn, rose less than one percent to $525,000; and in Queens, grew six percent to $318,000. The average sales price of a one-to-three family dwelling in New York City during the fourth quarter of 2018 was $796,000, a three percent increase from 2017’s fourth quarter average. The average sales price for a one-to-three family dwelling grew five percent to $1,049,000 in Brooklyn; five percent to $743,000 in Queens; eight percent to $556,000 in the Bronx; and six percent to $583,000 in Staten Island compared to the fourth quarter of 2017. There were 138 one-to-three family dwelling sales in City Island / Pelham Bay / Pelham Strip / Country Club / Throgs Neck / Schuylerville in the fourth quarter of 2018, a 10 percent increase year-over-year. The average sales price of a one-to-three family dwelling in the area was $571,000, an increase of seven percent from the fourth quarter of 2017. 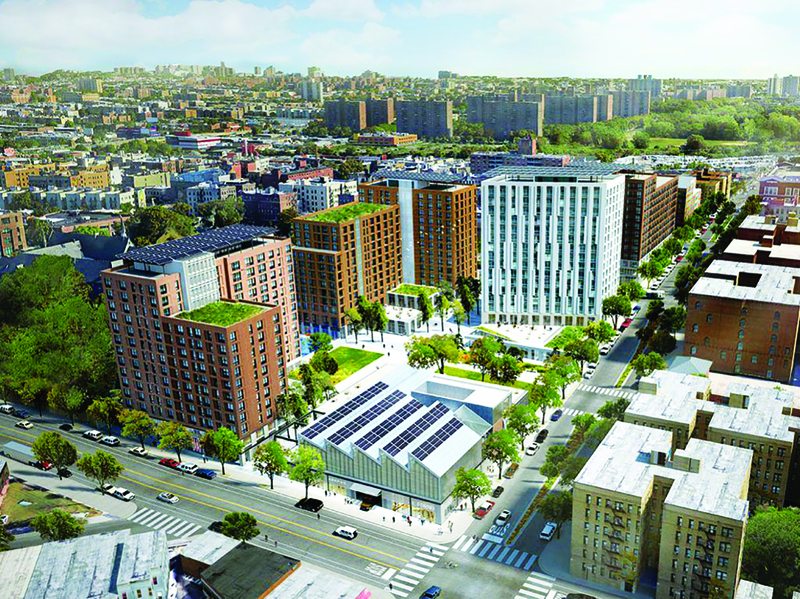 PICTURED TOP: The city awarded a contract to a team made up of Gilbane Development Company, Hudson Companies, and Mutual Housing Association build The Peninsula on the site of a former youth detention center in the Bronx.